Searching the index of a spec book to see if your trade is listed is one thing, but what if you’re looking for very specific, hard-to-find words or phrases that are not listed in the spec index? In the last IPIN Tip of the Month I covered how to create custom filters by searching for keywords, phrases, and CSI Codes using the spec index and CSI Mastercode search. If you missed that article, I recommend reading it by clicking here before moving ahead with this article . In this article I will show you how to use the SAM Search function to filter through every word in every spec book and addenda in the Builders Exchange IPIN System. What is SAM Search? SAM stands Spec and Addenda Mining. It allows members to search the entire spec book – not just the spec index. Trade names such as “honeywell”, “dupont”, “prosoco” and “trane” can be located quickly and easily and even tied to our nightly e-mail program. Other words that are difficult to find are readily available as well, such as “retaining wall”, “valve”, “crane” and all other specialty types of work that may have been missed in a Spec Index or CSI Mastercode search. SAM Search is possible because we scan all spec books and addenda using OCR (Optical Character Recognition) technology. After the scanning process, the results are indexed and ready for searching. OCR is not 100% accurate, but tests show an average accuracy of about 95%. Pictured above is the bottom half of the Create/Edit filter page with SAM Search selected in the purple region. For instructions on how to edit the top portion of the Create/Edit Filter page, please click here. You can enter any word or phrase you would like to search for in the body of every specification. 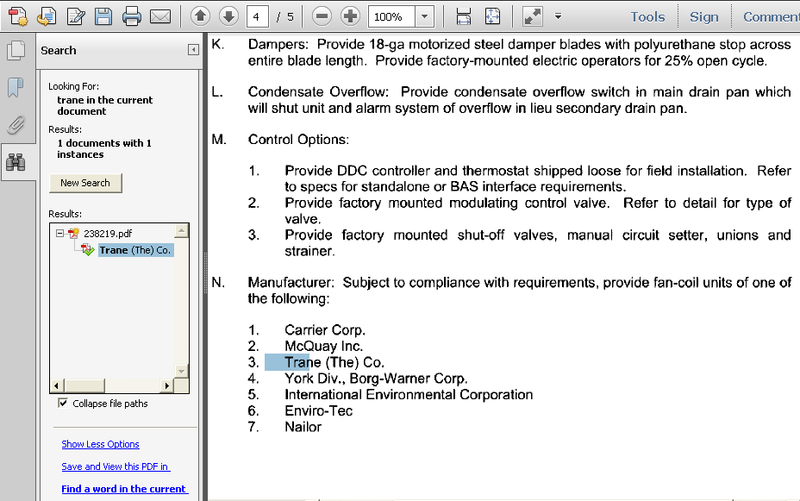 Broad phrases such “mechanical”, “electrical” or “lighting” should NOT be used. SAM Search is designed to find specific, hard-to-find phrases or words. This distinguishes it from the Spec Index Search. The expanded results appear exactly the same as a spec index or CSI Masterformat search with the exception of the additional “Search Results” content. 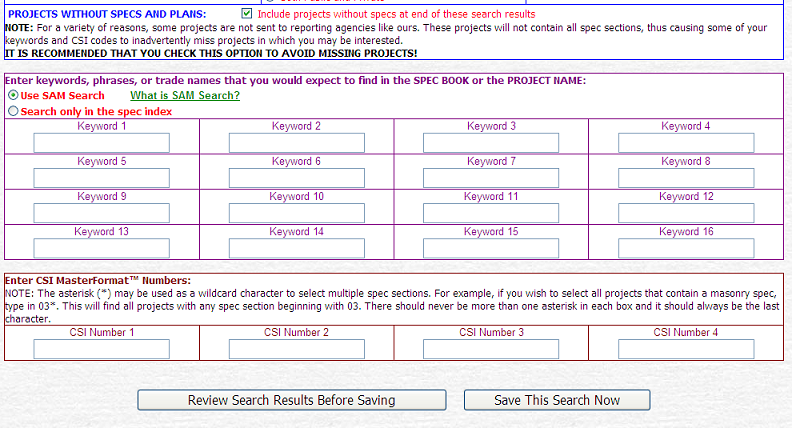 Every “hit” shows each spec section in each project which contained the keyword or phrase entered in your SAM Search. 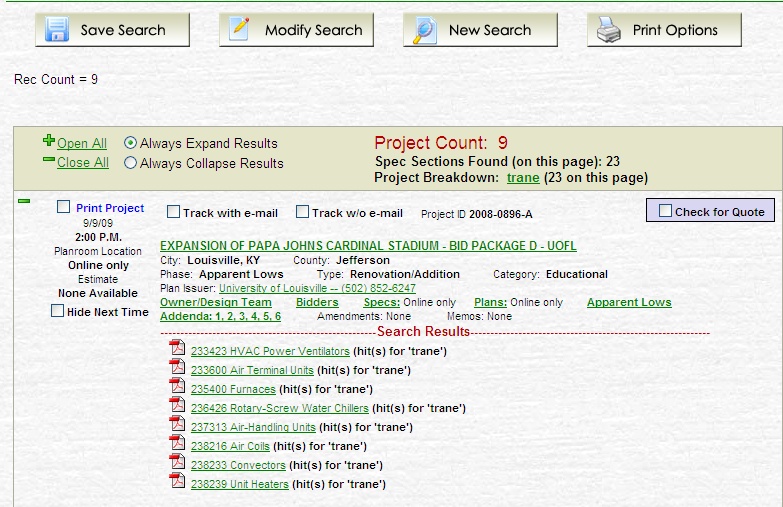 In the above example there were 8 spec sections in the project that had at least one hit for the word “trane”. Clicking on one of the links underneath the search opens the spec section and automatically conducts a search for the keyword, jumping directly to the where it is located in the spec book. If there are multiple hits, there will be multiple links that will send members directly to each individual reference. NOTE: Depending on which version of Adobe Reader you are using, the initial search window in the PDF may not show any results for the phrase entered in the SAM Search. If this occurs, click on “New Search”, delete the apostrophes surrounding the search phrase, then click the “search” button again. SAM Search is an excellent way to narrow a search to specific keywords or phrases members would like to find in a specification. The search saves time that may be spent needlessly scanning section after section of specs. It also helps find sections which may have otherwise been missed. The next training sessions will be held on February 24, 2012 (Lexington) and March 16, 2012 (Louisville). Call me, Aaron Thomas, at (502) 459-9800 or e-mail athomas@bxkentucky.com to RSVP!